The Cisco Catalyst 3560X series switches offer exceptional security with integrated hardware support for MACsec defined in IEEE 802.1AE. MACsec provides MAC layer encryption over wired networks using out-of-band methods for encryption keying. The MACsec Key Agreement (MKA) protocol provides the required session keys and manages the keys required for encryption when configured. MKA and MACsec are implemented following successful authentication using 802.1x Extensible Authentication Protocol (EAP) framework. 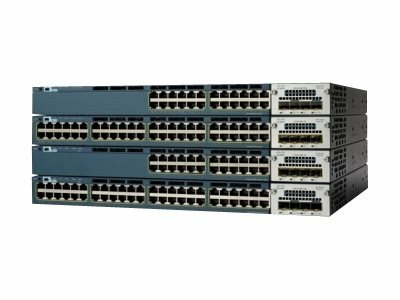 The Cisco Catalyst 3560X series switches support dual redundant power supplies. The switch ships with one power supply by default and the second power supply can be purchased at the time of ordering the switch or at a later time. If only one power supply is installed, it should always be in the power supply bay. The Cisco Catalyst 3560X series switches provide superior layer 2 threat defense capabilities for mitigating man-in-the-middle attacks (such as MAC, IP, and ARP spoofing). TrustSec, a primary element of borderless security architecture, helps enterprise customers secure their networks, data and resources with policy-based access control, identity and role-aware networking, pervasive integrity, and confidentiality.